Sometimes you skip breakfast simply because you don’t have time to eat. Other times, you skip breakfast because nothing really appeals to you. This is a common occurrence for many people across the country. But when you skip breakfast, you may find that you feel just fine. It begs the question: Is breakfast really that important? Do you need to eat breakfast? It depends. Most people can skip breakfast and be totally fine. They’ll make it to lunch without skipping a beat. It all comes down to how you feel. Some people need breakfast or they’ll have to deal with mood swings — often referred to as being “hangry” — caused by low blood sugar. A healthy breakfast can stabilize your mood, helping you feel more positive, energized, and focused throughout the morning. 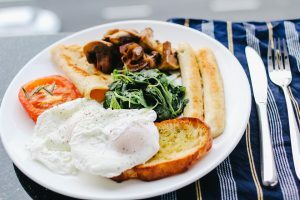 We can, however, bust the notion that breakfast is the “most important meal of the day.” This phrase was used to market breakfast cereal in the last century. In reality, it doesn’t mean anything. The most important meal of the day is whichever meal you get the most out of, whether it’s nutritional value, enjoyment, or both. Having a healthy, protein-rich breakfast does come with benefits, though. It gives you energy for the day and helps you avoid scrambling to find something to eat a couple of hours later when hunger sets in. All too often, skipping breakfast (or having a carb-heavy breakfast) leads people to raid the vending machine or make unhealthy food choices they wouldn’t ordinarily make. Along these same lines, skipping breakfast may encourage you to eat more later in the day at lunch or dinner. 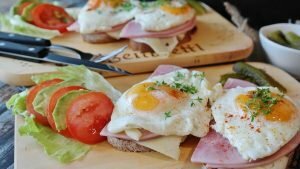 You may think you’re saving calories, but over the course of a day, you can end up consuming more calories than if you had simply eaten breakfast. With so much research on the subject of breakfast, one thing is clear: You should eat when you feel hungry. You don’t have to live by the conventional wisdom of “three squares a day.” When you listen to your body, you’ll feel better for it!